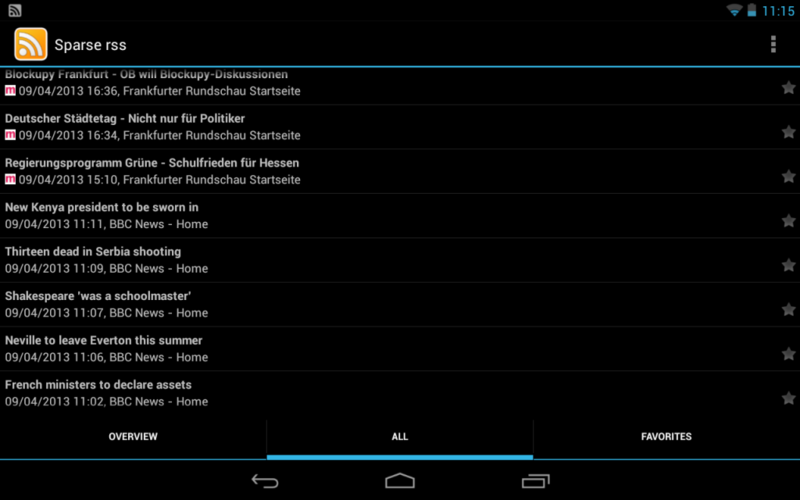 Do you pick posts to read on your 7″ Android tablet from a few RSS feeds ? Do you need an Android app to aggregate them, download the posts for offline reading and present them in a clean, lightweight list ? With 700000 apps available on the Google app store for Android, you think that would be a solved problem. You also expect that firing your favorite search engine with a query like “RSS feed aggregator offline android” would give you a few independent reviews to help you find the right app. Actually not. The query will return countless biased and ad-ridden reviews, pointing you to a collection of equally ad-ridden bloatware, designed to involve you in some random social network thingy. I have NO FRIENDS ! I want NO ADS ! I have NO MONEY ! Compare the results of the query “RSS feed aggregator offline debian KDE“: it takes you a few clicks to find Akregator, the best RSS aggregator you can get for desktop use. Delights of a corporate-free ecosystem where people create great open source software without economic incentives ! Anyway going back to Android, stay clear from all the suggested apps and go for sparse rss: it’s open source and does what it should without pain. This entry was posted in Howtos, Rants. Bookmark the permalink.